Organizing mail is, in my opinion, the most important part of conquering paper clutter. No one likes going through their mail. I know I don't. In fact, I can't name one person I know that does! That being said, the mail is a constant incoming source of paper. Therefore, the best way to deal with it is to do so on a very regular basis. 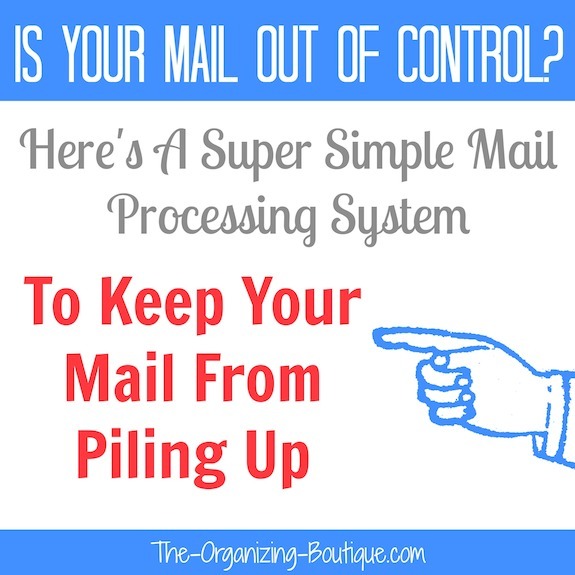 The following mail organizer tips will help you set up a receiving system, explain the organizing process in detail and prevail over the paper! Like mentioned above, the best way to deal with the mail is to do so on a regular basis. This means a system needs to be put in place for organizing mail. I go through my mail as soon as it comes in. I know of others that set time aside to go through their mail once a week or have designated this task to their partner who more successfully keeps up with it. Different systems work for different people, so your first objective would be to figure out what would work best for you and your family. How Do You Handle The Mail? The mail is a constant incoming source of clutter, and everyone handles it differently. What successful system do you have in place? Utilize the general organizing procedure of purge, sort and store, and apply it when organizing mail. 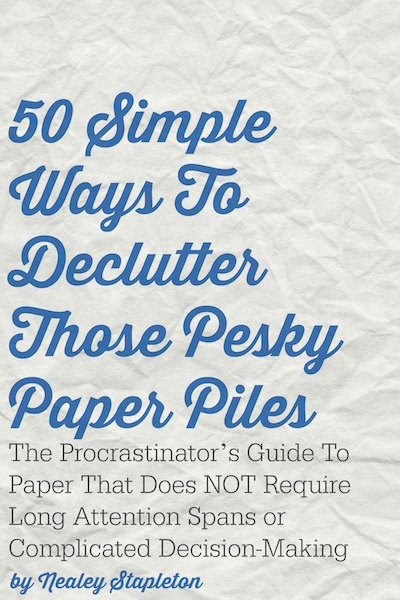 • Start by going through each piece of mail, and decide if it is worth keeping. • The junk is very easy to spot, so recycle or shred it immediately. This will probably reduce your mail pile by half. Woohoo! • Anything that is an action item like bills should be put in your "Action" file or wherever you keep papers that require action on your part. • Mail for other members of the family should be distributed accordingly. • Catalogs, magazines, and any other reading materials should be put in a place where they will be seen and therefore read. • Now that your mail has been purged and sorted, a storage system needs to be put in place for mail that is kept (i.e. action items, reading materials). • Create a home for action items that require your attention. I suggest using a tray that is located on your desk or workspace. This way it is in sight, in mind. • Designate a spot for each family member's mail. Stacking letter trays work well for this. Label each tray for each family member, and encourage them to go through their mail regularly. • Where do you do your reading? Let's say it's on the couch in the family room. Put an open basket or bin near the couch and throw your incoming reading materials in there. • Successfully organizing mail means going through it on a regular basis. Whether it's everyday or once a week, be sure to keep at it often and always. • Don't let your action items, reading materials, etc. pile up either. Tend to them. When finished, file or toss them accordingly. Organizing mail is much easier if there's less junk coming in to your inbox. 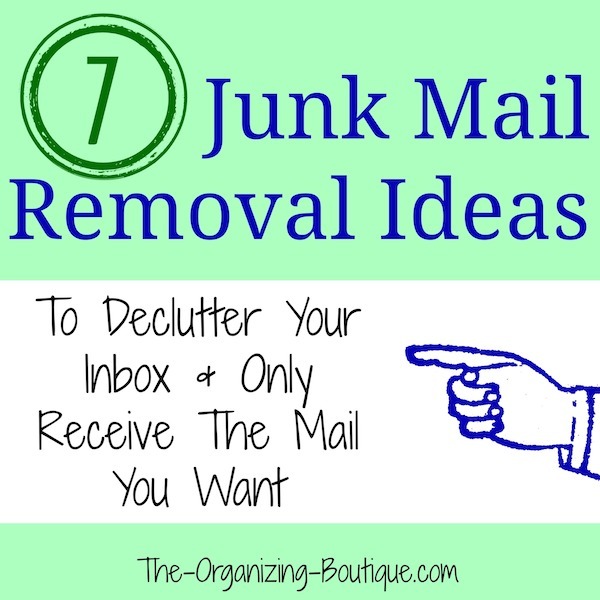 Here's 7 junk mail removal ideas. This wood mail organizer made by Gramata is great for home or office. It has adjustable shelves, label holders and hooks on the sides. Get rid of the junk mail immediately! Keep this 12-gallon recycling bin near the front door or in a home office for quick and easy discarding. Keep this stacking inbox by the front door or where everyone who lives in the house will pass it everyday. Label each tray for each family member, and sort the mail into it accordingly. Voila! Everyone gets their mail. Use this bright product to hold your action items. When the mail comes in, immediately put the items that require your attention in this modern magazine file. It looks good and catches your eye, so you don't forget to do your action items. Organizing paperwork, organizing bills and sorting mail is stylish with this fun home mail organizer. It also comes in black. Check it out! Want to see even more options? These are the top-rated home mail organizer products on Amazon!